Characterization of porous materials by small-angle scattering has been extensively pursued for several years now as the pores are often of mesoscopic size and compatible with the length scale accessible by the technique using both neutrons and X-rays as probing radiation. With the availability of ultra small-angle scattering instruments, one can investigate porous materials in the sub-micron length scale. Because of the increased accessible length scale vis-a-vis the multiple scattering effect, conventional data analysis procedures based on single scattering approximation quite often fail. The limitation of conventional data analysis procedures is also pronounced in the case of thick samples and long wavelength of the probing radiation. Effect of multiple scattering is manifested by broadening the scattering profile. Sample thickness for some technologically important materials is often significantly high, as the experimental samples have to replicate all its essential properties in the bulk material. Larger wavelength of the probing radiation is used in some cases to access large length scale and also to minimize the effect of double Bragg reflections. Effect of porosity and pore size distribution on the low-frequency dielectric response, in the range 0.01–100 kHz, in sintered ZrO2—8 mol% Y2O3 ceramic compacts have been investigated. Small-angle neutron scattering (SANS) technique has been employed to obtain the pore characteristics like pore size distribution, specific surface area etc. It has been observed that the real and the imaginary parts of the complex dielectric permittivity, for the specimens, depend not only on the porosity but also on the pore size distribution and pore morphology significantly. Unlike normal Debye relaxation process, where the loss tangent vis-à-vis the imaginary part of the dielectric constant shows a pronounced peak, in the present case the same increases at lower frequency region and an anomalous non-Debye type relaxation process manifests. 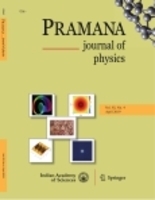 This paper deals with the small-angle neutron scattering (SANS) investigation on solution-quenched PH13-8 Mo stainless steel. From the nature of the variation of the functionality of the profiles for varying specimen thickness and also from the transmission electron microscopy (TEM), it has been established that the small-angle scattering signal predominantly originates from the block-like metallic carbide precipitates in the specimen. The contribution due to double Bragg reflection is not significant in the present case. The single scattering profile has been extracted from the experimental profiles corresponding to different values of specimen thickness. In order to avoid complexity and non-uniqueness of the multi-parameter minimization for randomly oriented polydisperse block-like precipitate model, the data have been analyzed assuming randomly oriented polydisperse cylindrical particle model with a locked aspect ratio. Precipitates of ceria were synthesized by homogeneous precipitation method using cerium nitrate and hexamethylenetetramine at 80°C. The precipitates were ground to fine particles of average size ∼0.7 μm. Circular disks with 10 mm diameter, 2 and 3 mm thickness were prepared from the green compacts by sintering at 1300° C for three different sintering times. Evolution of the pore structures in these specimens with sintering time was investigated by small-angle neutron scattering (SANS). The results show that the peak of the pore size distribution shifts towards the larger size with increasing sintering time although the extent of porosity decreases. This indicates that finer pores are eliminated from the system at a faster rate than the coarser ones as sintering proceeds and some of the finer pores coalesce to form bigger ones. A two-dimensional position sensitive neutron detector has been developed. The detector is a3He + Kr filled multiwire proportional counter with charge division position readout and has a sensitive area of 345 mm × 345 mm, pixel size 5 mm × 5 mm, active depth 25 mm and is designed for efficiency of 70% for 4 Å neutrons. The detector is tested with 0.5 bar3He + 1.5 bar krypton gas mixture in active chamber and 2 bar4He in compensating chamber. The pulse height spectrum recorded at an anode potential of 2000 V shows energy resolution of ∼25% for the 764 keV peak. A spatial resolution of 8 mm × 6 mm is achieved. The detector is suitable for SANS studies in theQ range of 0.02-0.25 Å−1. Titanium metal bodies have been prepared from the sintered powder compacts of TiO2 by a novel molten salt electrochemical approach, known as FFC Cambridge process. The phase and compositional characterizations of both Ti and TiO2 have been carried out by X-ray diffraction. The pore morphologies of sintered TiO2 pellet and the metallic Ti pellet, obtained after electrochemical reduction have been studied by SANS over a scattering wave vector q range of $0.003–3.5$ nm-1 using a double crystal diffractometer and a pin-hole collimated SANS instrument. In the case of reduced metal pellet, average pore size was found to be larger than that of the oxide pellet as the voids left behind after the oxygen atoms left the oxide matrix, could not coalesce. Ceria powders were prepared by gel combustion process using cerium nitrate and hitherto unexplored amino acids such as aspartic acid, arginine and valine as fuels. The powders have been characterized by X-ray and laser diffraction. Cold pressed compacts of these powders have been sintered at 1250°C for 2 h. Internal pore microstructure of the sintered compacts has been investigated by small angle neutron scattering (SANS) over a scattering wave vector 𝑞 range of 0.003–0.17 nm-1. The SANS profiles indicate surface fractal morphology of the pore space with fractal dimensionality lying between 2.70 and 2.76.